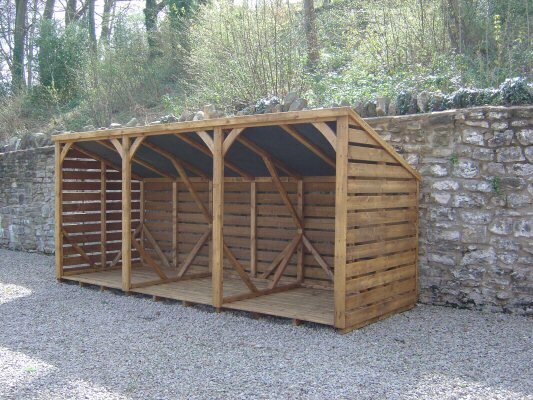 Built to last, our high quality Handmade Log Stores are individually made to order. Free delivery, and a choice of straight or curved side bars. 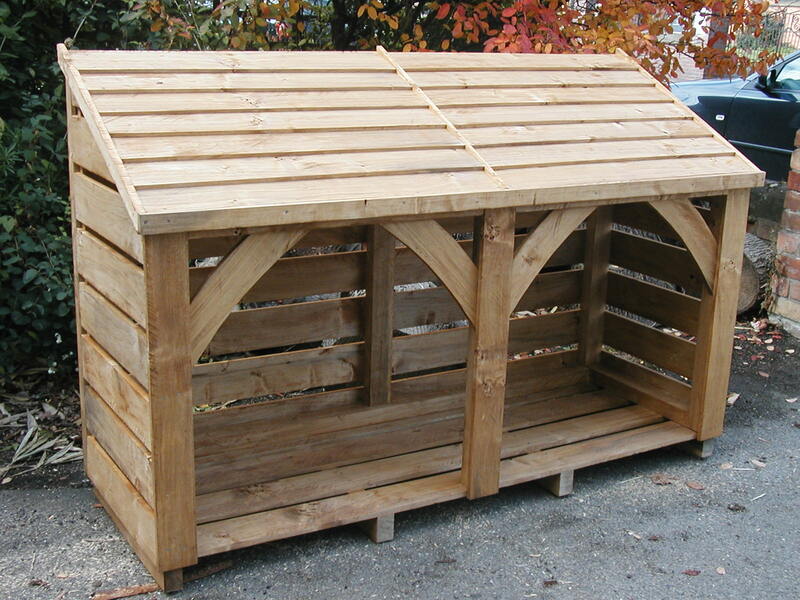 We deliver them fully constructed and treated, ready to be filled with logs and used. 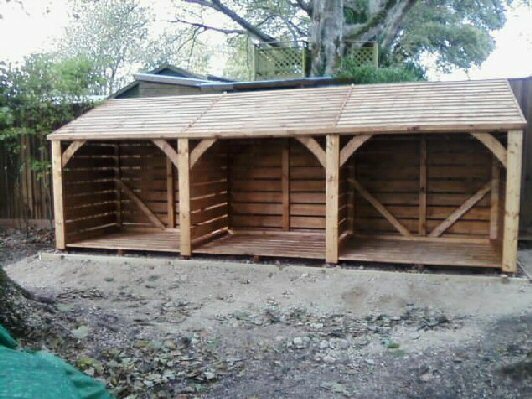 Each log store is specifically designed for both seasoned wood to keep it dry, and to season firewood. 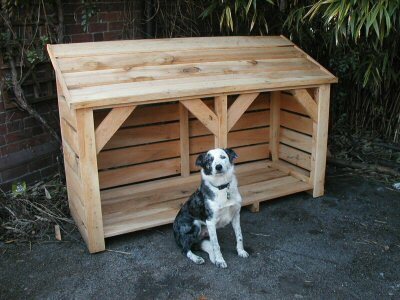 At the moment (April) LEAD TIME is around 2 weeks for standard and bespoke, and around 6 weeks for Cedar orders. On our wood stores we use quality local wood, not imported tanalised wood, so it looks like wood should. We put a rain proof membrane on the under side of the roof for extra weather protection. The treatment is guaranteed to prevent rot and boring insects and to be rainproof. So, with a small amount of yearly care your log store will last you a lifetime and keep looking good! 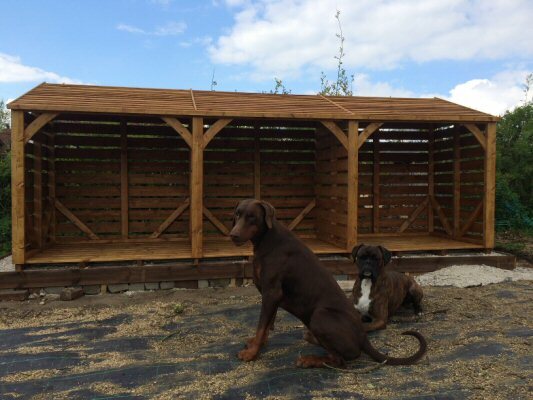 If you need a Bespoke log store made to your own dimensions, for example if space is a problem, we can make a store to fit the available space and maximise your storage potential. These are custom made log stores, between 3.7m to 5m long (12 to 16 feet), 2m high (6 feet 6 inches) and 1.25m (4 feet) deep. Anything this size is taken in sections and built by us at our customers home. 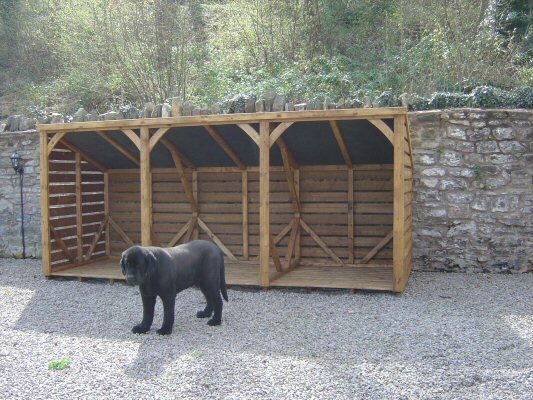 This is another bespoke wood store, notice the roof is higher at the front, and how the gorgeous Dudley thinks it might be a new summer house for him. We even have smaller Log Stores to keep your wood and charcoal in for the Chimnea and Barbeque! If your main Logstore is located a distance from your home, you could also use this for smaller amounts near the door to save your legs on cold winter days. Being individually made to order, it usually takes around 2-3 weeks from order to delivery, but is longer at busier times of the year. 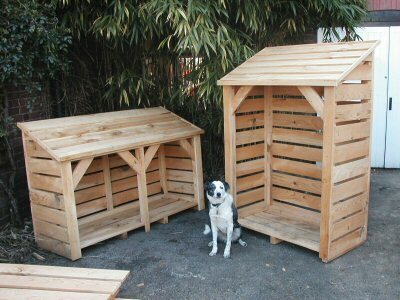 Our log stores, even customised ones, are delivered ready to use, fully constructed and treated. We use well known makes for the finish so that you can easily match your colour for repeat treatments in future years. Log stores, like anything made from wood, should never be sited directly on soil or grass, and for safety the ground must be level. On soil/grass water will be sucked up from the ground and rot the legs from the inside. Pebbles are the best for standing a logstore on, as water will very quickly run down the sides of stones and thus away from the wood. Burning dry wood is a must for any type of wood burning, wood stove or open fire. It does not matter what kind of wood you burn: as long as it is well seasoned. Dry wood burns more efficiently and gives off more heat. 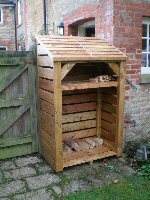 Use our wood store and you can buy pre-dried logs and keep them dry, or season your own. We recommend getting your wood well in advance so you have good dry logs ready for lovely warm winter fires. You should treat your store with a wood preservative every year. At the end of the burning season give 2 coats of preservative, and this will maintain the look of the store and ensure it remains usable and look good for many many years. An eco-friendly heating option, clean, efficient and carbon neutral, there is nothing quite like a real fire. Heating with wood is not only environmentally friendly, but can also make good economic sense, and be good for the local economy. Logs are a renewable and sustainable fuel meaning you don't deplete the earth's resources. Woodburning just warms you, not the globe.